KraussMaffei Technologies, uses automated machine condition monitoring to boost production volume and avoid machinery downtime. 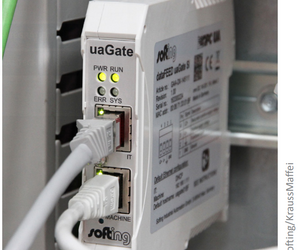 To interface its machine control systems with the IT system, the company has opted for the uaGate SI gateway from Softing plus the open, platform-independent OPC UA standard. Based in Munich, Germany, KraussMaffei Technologies GmbH is a leading manufacturer of machinery and equipment for the production and processing of plastics and rubber. Formed in 1838, the company looks back on a long tradition in machinery manufacturing, guided by a responsibility for offering its customers superior products that add value to their business. Customers in a wide range of manufacturing segments that includes automotive, construction, consumer goods, electrical/electronics, chemicals, white goods, medicine and pharmaceuticals are offered modern system and process solutions based on forward-looking megatrend topics such as lightweight engineering, surface finishing, reducing material/energy consumption and the use of natural fiber reinforced plastics. In order to ensure it remains able to meet its own high standards of quality, KraussMaffei Technologies took action some years ago. The company needed to record the states of its massive production machinery for parts weighing from 100 kg to 70 t. For this purpose, it deployed a defined TPM methodology to collect data that is used to optimize machine capacity utilization and production reliability. The process introduced to record OEE KPIs envisaged workers documenting both the production data as well as all abnormalities during normal operation or even machine downtime. To do so, data for each incident were entered manually in the company-internal SAP system. While this approach was able to achieve considerable improvements to efficiency, those responsible for the system also recognized that the manual entry method meant that information was neither continuous nor exact enough to achieve significant improvements to the high level already reached. This gave rise to the idea of having a kind of continuously updated ‘medical record’ for each machine used in production. The transparency and measurability this creates would then form the basis for further improvements to processes in and around production. For this to work, automated data collection would be needed, with defined records being stored by specialized MDC/PDC software – neither of which was present at project start. Despite the diversity of the machine room control systems – from traditional to state-of-the-art – the data records for entry into the MDC/PDC software had to be kept as similar as possible. For this reason, existing PLCs were flashed with a rudimentary version of the software that fulfils all of the technical requirements and outputs a total of 16 signals. “While this might look a little cumbersome in a modern control system, the same signals are then output as from a 20-year-old control system – so the data records are identical and that’s what counts,” adds SEP Group Technical Director Andreas Fischer. A solution was also needed that was able to provide simple, transparent connectivity between the heterogeneous machine pool and the IT system – to keep maintenance workloads manageable. Not least because the machines work with a huge variety of software packages, with many industrial PCs in the network running operating systems ranging from Windows NT to the latest versions. “This is why we were looking at Softing’s uaGate SI solution,” says Haas, explaining the next steps in the project. While a few small improvements were needed after initial tests of the machine communication setup, the overall idea of enabling transparent, real-time reporting on the status of all connected machinery, presented in both at-a-glance and detailed formats (using the automated OEE), was achieved without any serious problems. SEP Software Engineering is now involved in rolling out IT system integration to most of the company’s machine pool. The verdict on the project was very positive from all concerned. KraussMaffei Technologies regularly highlighted the competent advice and rapid data staging via OPC for the KraussMaffei network by SEP Software Engineering. For its part, SEP Software Engineering praised the prompt technical support offered by Softing for questions involving the gateway firmware. And the well-established team is already planning the next steps: KraussMaffei Technologies now wants to build on the progress made in a new project that uses the data acquired to enable condition monitoring for the machine pool to proactively detect machine outages. Once again, the Softing gateway is the perfect choice here, since the data are not only forwarded 1:1 to the database but can also be repurposed for other downstream applications. Softing Industrial’s Data Intelligence business unit is the expert in implementing and improving efficient and reliable digital data exchange processes in industrial applications as well as between production and IT. It enables the integrated manufacturing of the future, which involves networked systems across different sites and a continual need to optimize equipment and production processes. Softing Industrial Data Intelligence thus serves the ever growing demands of the Industrial Internet of Things (IIoT) and Industrie 4.0.